The talented pastry chefs at the more than 200 dedicated gluten-free bakeries in the U.S. create Instagram-worthy gluten-free cookies daily. Enlist their services this Valentine’s Day, allowing you to sit back and enjoy the glory—or send it to your loved ones. 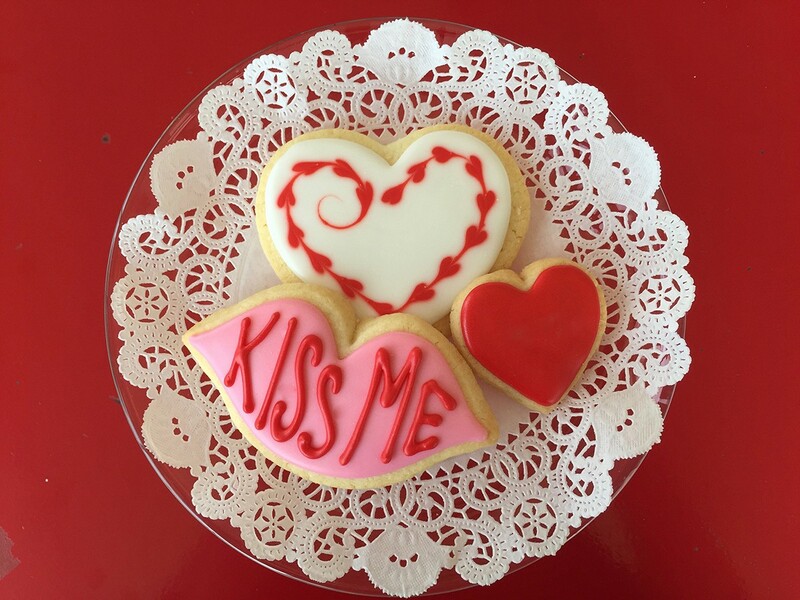 The pastry masters at Dempsey Bakery in Little Rock, Arkansas, can create cookies in just about any shape imaginable topped with royal frosting or colored sugar and a sweet message. The bakery’s shortbread sugar cookies are made in a certified gluten-, soy- and nut-free (except coconut) bakery. 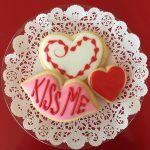 Its Valentine’s Day Iced Shortbread Kits include nine unfrosted cookies and white, red and pink icing for personalizing at home. Orders need a week lead time. Cookies contain eggs and dairy but can be prepared without. The decorated sugar cookies and sugar cookie sandwiches stuffed with frosting from Epiphany Bakery in Naples, Florida, are topped with royal icing and a choice of regular or natural food coloring, colored sugar and sprinkles. This versatile bakery can customize cookies to suit most dietary needs, including Paleo, Keto, vegan and even sugar free. Order by phone two to four days ahead of time. Cookies contain eggs, cornstarch (baking powder) and almond meal. Peanut butter is on the premises. 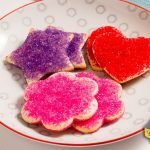 Sprinkles, colorful sugar or royal icing adorns the heart- and flower-shaped shortbread sugar cookies at Gluten Free Gloriously in Stirling, New Jersey. 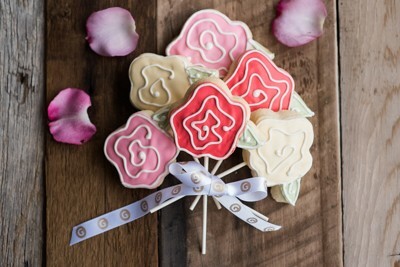 This certified gluten- and peanut-free bakery also makes sugar cookie pops and bouquets. Other options include vegan and dairy-free sugar cookies. Allow a week lead time for orders. Cookies contain eggs, dairy and cornstarch (baking powder). Sweet Cake Bake Shop in Kaysville and Salt Lake City, Utah, stands out in the sugar cookie arena with its cream cheese and lemon cream cheese beauties topped with a choice of almond glaze or cream cheese frosting. Both locations only accept phone orders. Cookies contain eggs, dairy, almond meal and cornstarch (baking powder). 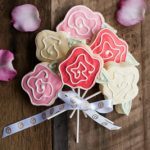 Say “I love you” with a bouquet of rose cookies on lollipop sticks from Gluuteny Gluten Free & Dairy Free Goodies in Pittsburgh, Pennsylvania. 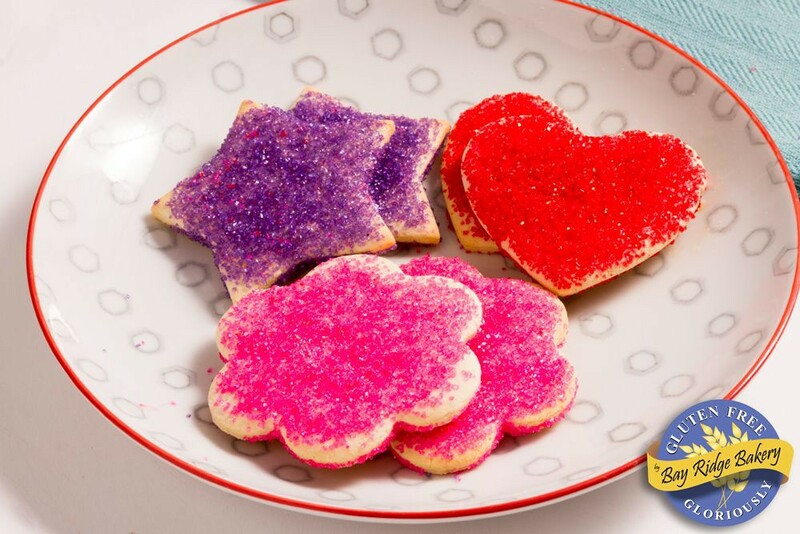 Or go traditional and dress up sugar cookie hearts with dairy-free royal icing or buttercream frosting and colored sugar. Everything prepared here is dairy free. Place orders two to four days ahead of time. Cookies contain eggs and cornstarch (baking powder). Of course, many other gluten-free bakeries offer gorgeous sugar cookies. Unfortunately, these establishments don’t ship their wares. However, we still wanted to give them a shout-out for all the hard work they put into making sensational gluten-free treats: Kyra’s Bake Shop (Oregon), Melinda’s Gluten Free Bakery (California) and The Baked Bee (Arizona). I only wish I lived closer!